I really enjoy showing you all my new vintage finds in my "my vintage week" posts - it's so great to have an enthusiastic response! Mr Odd One Out is so used to coming home and finding new (old) stuff that he can be rather underwhelmed with my finds these days. Of course my house is already packed to the brim with crazy old stuff as I have been collecting vintage since I was wee young thing, but more seriously once I settled in a more permanent (ish) house. Lets just say you're going to need both hands and possibly some feet to count the years (now that doesn't give away my age too much does it!) Anyway, I would love to show you some of my favourite things that I have collected over the years and give you a bit of a peek into my vintage way of life too! This little collection is hiding in a rather dark corner of my dining room - I think they rather suit being there as they have a kind of Victorian and a little bit Goth feel. This isn't my usual style but I just love all these pieces so they have kind of ended up together. 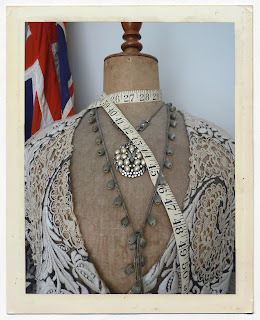 Dolly is my Antique mannequin - named for her rather voluptuous figure! She was made back in the day when one was required to wear corseted undergarments. I found her on Trade Me, and even though she lived in Lower Hutt and was 'pick up only' I managed to convince Mr Odd One Out's lovely Dad to get her for me on one of his work trips. I'm sure he thought I was a bit mad because she cost a fair bit - but worth every penny I think. Dolly is wearing some very special things..... The jacket I picked up at one of my favourite markets in London. It's called Alfies Market and I have found some awesome things there. It is so old and delicate - hand sewn in handmade lace and silk tulle. I think it's Victorian and I do wear it! Around her neck is a necklace I picked up at a store in Auckland I just love, Victorian Gilt. I could literally spend hours in there fossicking about. The tape measure is from the Camberwell vintage market in Melbourne - wow that market had me wishing I lived in Melbourne, I would so be there every week! The little vintage gold trim - I wear as a necklace - is from one of my favourite places in the world (from my limited travel experience!) The Marche aux Puces is on the outskirts of Paris and is one of the coolest places to find the vintage and also the unexpected. You could get lost in all the little alleys and ateliers - and that would not be a bad thing at all. I've seen Dinosaur eggs and even a stuffed sabre tooth tiger for sale there! Look it up on Google images - you'll see what I mean! Behind Dolly is a VERY large vintage New Zealand flag. The wooden pole part is over 7ft tall and the flag is all hand sewn in pieces with applique stars. I found this on Trade Me also, and it was a complete fluke of a buy. It was really cheap with a very bad, dark photo, you couldn't tell the size or condition at all. We just bid with fingers crossed and were super excited when we picked it up - I just love those scores! 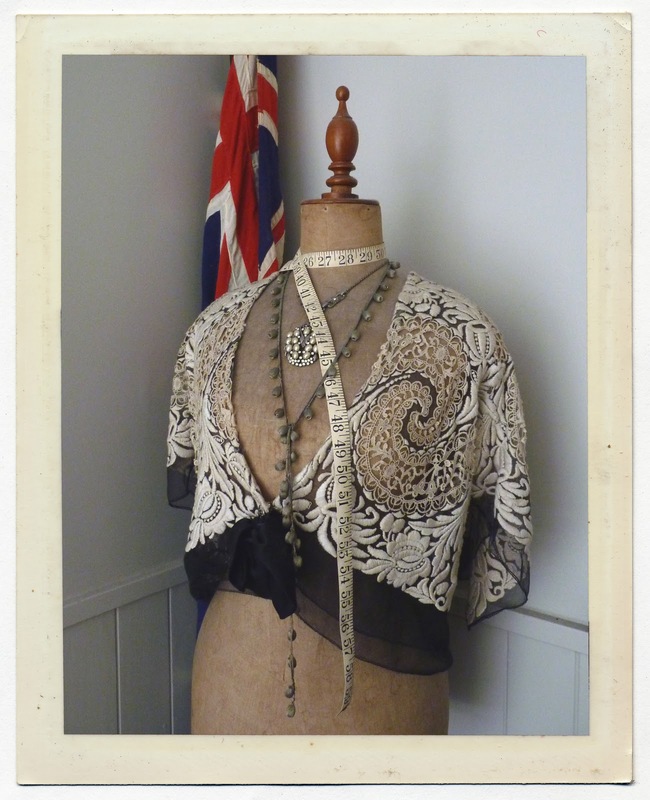 Hope you liked this little peek into my vintage world - there's more to come!